We are currently living in a digital world where we can easily get connected with people from all around the globe. Social media sites like Instagram make this incredibly easy, and it has opened up a number of positive opportunities. I personally really like that I can learn from others in the Health and Fitness industry by just picking up my phone and logging into an app. It enables me to improve upon my skills by picking up great tips, which then means working out better. There are many types of fitness accounts on Instagram in particular, so I’m about to show some of my favourites. They aren’t to everyone’s liking, but all have large followings and fans who are into exactly what they have to offer. One of my favourite account belongs to a fantastic woman named Alexia Clark. I am not 100%sure where she’s from but I like her because she is not just a ‘poser’ like many fitness celebrities! She is happy to share great workout program videos on her profile, and much more. 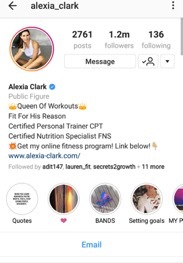 If you are bored with your workout routine or you cannot see any improvements, I would definitely recommend following her and trying out her workouts. The next interesting profile is from a Dutch lady named Yanita Yancheva. She is a young fitness model, brand ambassador and designer of the Body Engineers, which was created by her boyfriend Tavi Castro and Lazar Angelov. They are also very well known in the fitness world, too. As you can see, she is a young mum with a young baby. I have chosen a picture from her profile where you can see her expecting a baby, and 3 months after she has given birth to her little daughter. She is pretty incredible. She is a great motivator for all ladies who are expecting a baby. Being pregnant doesn’t always mean you have gain 10-20kgs, you can exercise and eat healthy during your pregnancy and your recovery will be much quicker afterwards. 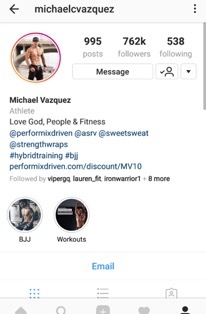 Let me introduce you to Michael Vazquez, who has some very nice and meaningful posts across his profile. He also has incredible body strength and keeps himself in great shape, so if you are looking for some challenging cross fit workout programs then he is the guy you want to follow. In the next two posts I would like to show you 2 food related profiles. 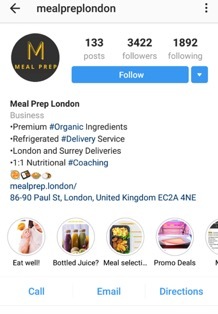 Meal Prep London is run by a company with the same name and they provide organic healthy fitness meals. I have not tried them yet as I am a pretty good cook (and I am happy to prep my own meals on a daily basis) but judging by the pictures, they look really nice. Also, what I like is they do research on different meal ingredients and you can really learn a lot from this page. They say we are what we eat, and you may not know this but a fit body is created 70% in the kitchen and only 30% in the gym. To avoid eating unhealthy foods, and to ruin your diet, the best way is to prepare your own meals for the whole day and take it with you to work, to the gym, and even to your friend’s house as well. 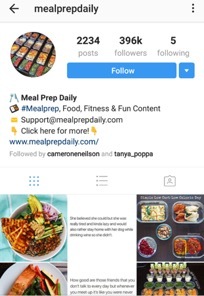 On the Meal Prep Daily profile you can also find some inspiring ideas; great if you’re bored of your plain grilled chicken breasts and rice. This site offers some help to enable you to get your own prep tools too, like containers and scales for example. I hope you will find this article useful and these profiles will help you and inspire you to get closer to your fitness goals.